Knowing nothing about Annie Oakley, either the true story or the legend, but always up for a musical or a Barbara Stanwyck film, I watched two versions of her story a couple weeks ago, thanks to the good people at TCM. The first was a musical version, Annie Get Your Gun, based on a hit Broadway show that starred Ethel Merman and featuring songs by Irving Berlin (“There’s No Business Like Show Business” and “Anything You Can Do, I Can Do Better” being the two big hits). The film adaptation stars Betty Hutton, who I’m almost completely unfamiliar with, I liked her in Preston Sturges’s Miracle at Morgan’s Creek, which is the only other movie I’ve seen her in, and Howard Keel, a giant ham whose hand-on-his-hips pomposity I’ve come to find quite endearing in films like Seven Brides for Seven Brothers, Kismet and one of my favorite musicals, Kiss Me Kate. The director of that last film, George Sydney directed this one as well, and I’ve generally found his films (Anchors Aweigh, The Harvey Girls) to be pleasant if unexceptional (my Kate love notwithstanding), so all things considered, my hopes were relatively high. Instead, I found Annie Get Your Gun to be an abomination. The film starts reasonably well, but takes a drastic turn for the worse the moment Hutton appears, bug-eyed and dressed like one of Peter Pan’s lost boys exclaiming her dialogue in a ridiculous accent at an incredible volume, like a ten year old girl doing a Cletus the Slack-Jawed Yokel impression in a wind tunnel. Hutton’s Annie is a great marksman who takes up the challenge of dueling the star attraction of Buffalo Bill’s traveling Wild West show, Howard Keel’s Frank Butler. However, the moment she sees Butler, she’s stunned into mouth-agape lust at his beauty. Setting that aside for now, she wins the contest and joins the show. As the months go on, Butler becomes increasingly distressed that Annie’s a better shot than he is, which complicates their budding romance. Annie learns to read and be more ladylike (wearing dresses, taking baths). Eventually, Butler leaves her after Annie performs a breathtaking stunt in the show, proving that she is the bigger star. The two are apart for awhile, with Butler having joined a rival show, but come together again in the end after a grudge match Annie throws, allowing Butler to be proclaimed the best sharpshooter in the world. Running alongside the love story plot is Annie’s relationship with Sitting Bull, the great Sioux Indian chief who was part of the Buffalo Bill show. There’s three things that offended me most about the film. The first is on the basic level of craft, and by this I don’t just mean Hutton’s performance. Ethel Merman originated the role on Broadway, and I can see how she would work playing the role this big: Merman was a titanic force of nature, everything she did was huge. Hutton though, seems like she’s playing at being big and every note comes out false. Judy Garland was originally going to star in the film, and her unique dramatic intensity would probably have made the film work. I certainly can’t imagine her mugging about the way Hutton does. This was pretty much the end of the line for Garland as a major star though. During this time she was replaced in The Barkleys of Broadway and Royal Wedding was released from her MGM contract. At age 28 her film career, aside from a brilliant performance in George Cukor’s A Star is Born and an Oscar nominated, supporting role in Judgement at Nuremburg, was essentially over. Garland wasn’t the only person fired from the film though. It was originally directed by Busby Berkeley, who was replaced by Charles Walters, who was then replaced by George Sydney. 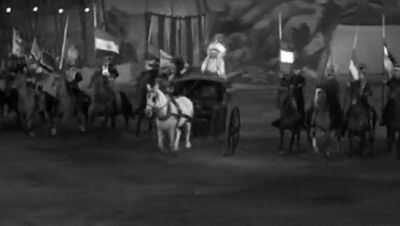 There’s a hint of Berkeley left in the film in the final shot, an arial view of dancing horses forming one of Berkeley’s trademark geometric patterns, but for the most part the film feels completely generic. More than that though, there’s an incongruity between the apparent attempt at verisimilitude in the directing and the other major elements of the film. Not just Hutton’s performance, which is jarringly unnaturalistic next to the supporting performances by Louis Calhern, Keenan Wynn and Howard Keel (none of whom were ever particularly notable for their restraint, this is a side effect of Hutton’s egregious broadness), but also in the musical numbers. Some of Irving Berlin’s music, especially the film’s signature song “There’s No Business Like Show Business” indicate an artificiality in the production. They seem to acknowledge that they exist as a part of a musical comedy on a Broadway stage. But in the film, they take place entirely in natural settings. Actors singing about Broadway while on a dusty Indianapolis fairground is just weird, which can be a virtue, but Sydney never develops the incongruity in any way. This should be as playful a film as Vincente Minnelli’s The Pirate, where Garland and Gene Kelly’s performances, along with the screenplay and Minnelli’s direction of the musical numbers create a constant back and forth between fantasy and reality which leads to a fundamental, ecstatic declaration of the joy of performance at the film’s climax with Cole Porter’s “Be A Clown”. I’m not sure exactly whose fault this is, but Sydney did a fine job walking this tightrope in Kiss Me Kate, another musical written by Cole Porter that plays with the conflict between performance and reality. I guess, then, the issue is not so much a matter of Sydney’s inadequacy for the material (though Berkeley and Garland might have made something of it) but rather simply the difference between Cole Porter and Irving Berlin. The next two major issues I have with the film are political in nature, and I’m not sure which is more off-putting. The first is the inherent sexism of the story. Annie is the best sharpshooter in the world, but she can’t have the man she loves because his ego demands that he be superior to her in every way. The conflict in the film is her independence, and only when she throws a final match to him, allowing him to be the dominant, superior one can they live happily ever after. The parallels to the post-war issue of men returning home only to find their wives occupying the workforce, and the need therefore to assert them back into the home via a hollow ideology of male superiority are obvious and needn’t be lingered on. Suffice it to say that the fact that we are expected to cheer and swoon with romance when Annie finally puts herself in her proper place is nauseating at best. The racism in the film is only slightly less obvious, and has to do with the way it treats its Indian characters. 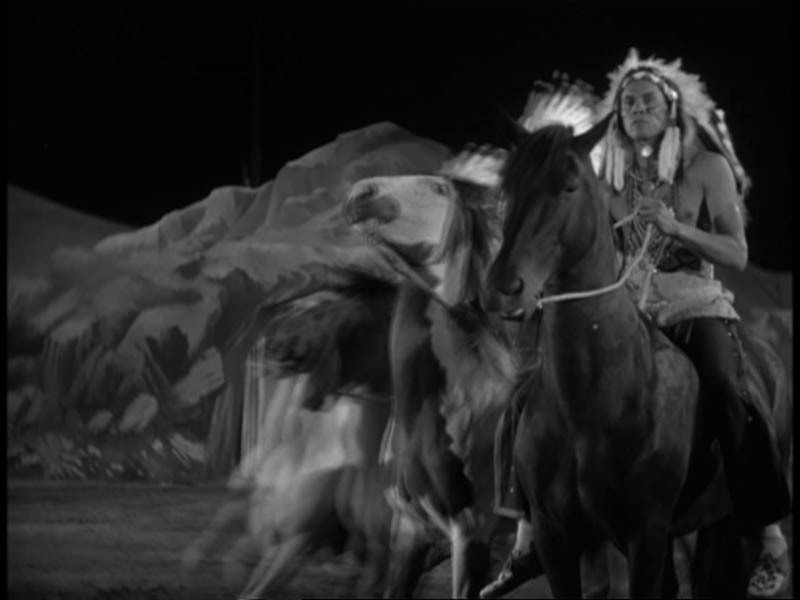 A couple weeks ago I ranted about the way the documentary These Amazing Shadows used John Ford’s The Searchers to show the negative ways in which Hollywood has portrayed Indians throughout the years, despite the fact that The Searchers is itself about that very issue and is very much against it. They should have used Annie Get Your Gun instead. 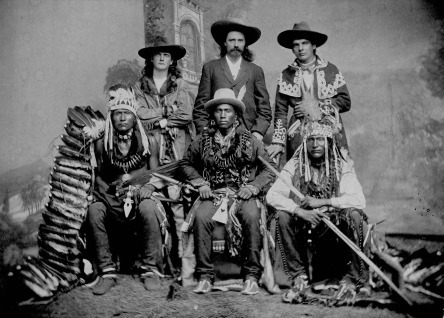 Buffalo Bill’s Wild West Show, in reality, had a fairly complex relationship with Indians. On the one hand, the shows itself generally cast the Indians in the role of villain, with big set pieces wherein Indian attacks are fought off by settlers and cavalry. On the other, Bill encouraged the Indians to set up traditional camps, which onlookers could walk through and see the people as they actually lived. (See his wikipedia entry: “He called them “the former foe, present friend, the American”, and once said, “Every Indian outbreak that I have ever known has resulted from broken promises and broken treaties by the government.”‘) None of this tension is present in Annie Get Your Gun. The Indians are presented as cartoons on-stage, with Sitting Bull as goofy comic relief, and even worse off-stage. Our first introduction to them has them destroying a train car for no apparent reason (literally, the shot foregrounds an Indian meaninglessly tearing apart a seat cushion with a tomahawk). When they go to France they destroying a pastry shop devouring eclairs left and right. The Indians in the film are children at best, monsters at worst. That the best they come off is in the goofy, casually hideous “I’m an Indian Too” number is saying something. That this film was made the same year as Anthony Mann’s defiant Devil’s Doorway, two years after John Ford’s nuanced yet damning Fort Apache, and was more popular than either is appaling. Fortunately, all these issues are resolved in an earlier version of the Annie Oakley story, directed by George Stevens and starring Barbara Stanwyck, though it is by no means a perfect film. To begin with, Stanwyck, in my opinion the greatest star in motion picture history, was constitutionally incapable of giving a false performance, one without nuance or intelligence or, most in contrast to Hutton’s work, dignity. The contrast between her Annie and Hutton’s is apparent from the very start. 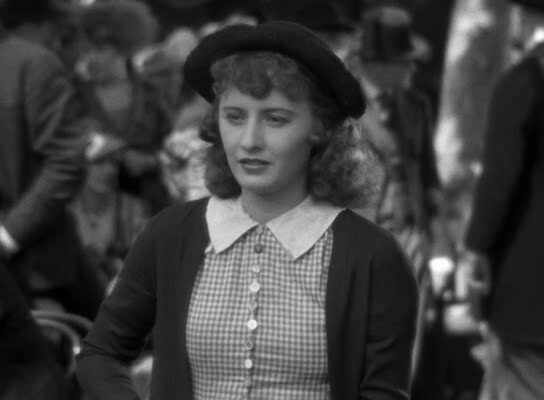 Hutton literally walks out of a bush, Stanwyck lives in a town, a small town, but one populated by recognizable human characters. She has a mother, a wagon, dresses and washes like any other human and can even read and write. In other words, she’s just a small town girl who knows how to shoot, rather than a freak of nature (a competent woman? Egads, how bizarre!) Stanwyck too falls in love at first sight of Buffalo Bill’s star sharpshooter (here renamed Toby Walker for some reason, Frank Butler was the name of Oakley’s real-life husband), and their first contest proceeds along the same lines as in the musical. But, after seeing how good Annie is, the crowd begins to heckle Toby and Annie misses on purpose to let him save face. Afterwards, she’s quite open about her throwing the match (to everyone, including Toby), but Bill hires her anyway and she joins the show. The vital difference here is that as Annie and Toby fall in love, he insists they pretend to be rivals for the sake of showmanship. In reality, he doesn’t care one bit that’s she’s a better shot than he is, in fact, he’s quite proud of her skill, but he understands that the audience is more likely to be hooked if he plays the role of the villain. In other words, Toby is a recognizable human being, well-rounded and thoughtful, whereas the musical’s Frank Butler is defined only by his one neurosis (along with his prettiness and height). Also, this construction of the plot sets up a tension between reality and performance that the musical could have profitably explored. 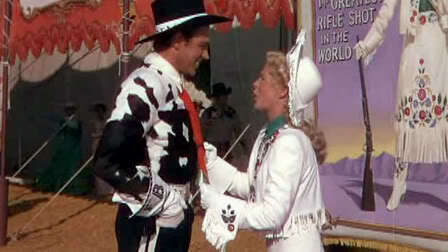 Similarly, the Indians fare much better in Annie Oakley than they did in Annie Get Your Gun. Sitting Bull still functions as comic relief, though his cultural misunderstandings are far fewer here and less signs of his own idiocy than the fact that he just doesn’t particularly care about white people’s sense of propriety. Sitting Bull here is almost a tragic figure, played by Chief Thunderbird, a Cheyenne actor and technical advisor (the musical cast J. Carrol Naish, an Irish-American actor who played General Sheridan that same year in John Ford’s Rio Grande) as a man out of step with reality, but determined to survive regardless of how ridiculous or bleak his and his people’s situation becomes. This is nowhere more apparent than at the film’s climax, where Sitting Bull on his horse looks into the crowd and sees Toby (he and Annie have broken up over a misunderstanding, and he’s left the show to run a shooting gallery in New York City). Toby knows he’s been spotted and takes off, with Sitting Bull in hot pursuit. He tracks him through the city streets, creating a wonderfully incongruous image of an Indian chief in full regalia stalking through a modern metropolis. Annie Oakley is a flawed film. The plotting is full of the kinds of conflicts that would easily be resolved if only everyone let everyone else speak. In fact, the big dramatic scene that causes Annie and Toby’s breakup is a textbook example of this kind of lazy screenwriting, as Annie is literally interrupted by everyone every time she tries to explain what actually happened. 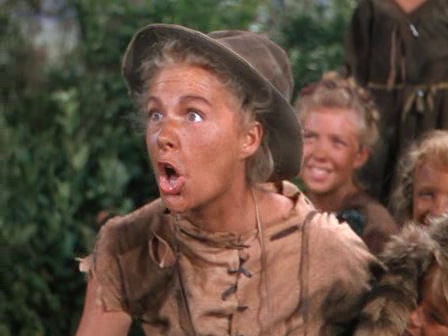 But still, given just how purely awful my experience of Annie Get Your Gun was, watching it was a revelation. I’m not sure if this is always the case with 1950s remakes of 1930s films. Both John Ford’s Mogambo and George Cukor’s A Star is Born build on their antecedents (Victor Fleming’s Red Dust and William Wellman’s A Star is Born, respectively) in interesting and thoughtful ways. But the parallel I’m best able to draw between what 1950 did to the 1935 Annie Oakley story is the contrast between the two film versions of Show Boat. The first, by James Whale from 1936 is a nuanced portrait of a racially complex society, with dignified performances from its minority characters (including the electrifying Paul Robeson) which is turned into a much simplified musical starring Howard Keel and directed by George Sydney.